The Magnum Labs blog has a post up which contains a RTL fix for your Delphi 10 Seattle apps on Intel devices. Basically the issue is that the status bar incorrectly calculates it’s position and it’s X position is off. Firemonkey apps run on Android Intel devices using LibHoudini which I believe comes with all Android 4.4+ devices. This issue only affects Android apps running on x86. Additionally, a lot of Android emulators (like BlueStacks) run on x86 as well. So if you are running on any of those you can also apply this fix. You will need to copy the FMX.Platform.Android.pas file from the Firemonkey RTL to your project folder. You can then edit this file and add the code from the blog post. The modified file will be used instead of the Firemonkey RTL file when you compile your app. This fix should also work with Appmethod and you can modify it to work with C++Builder. 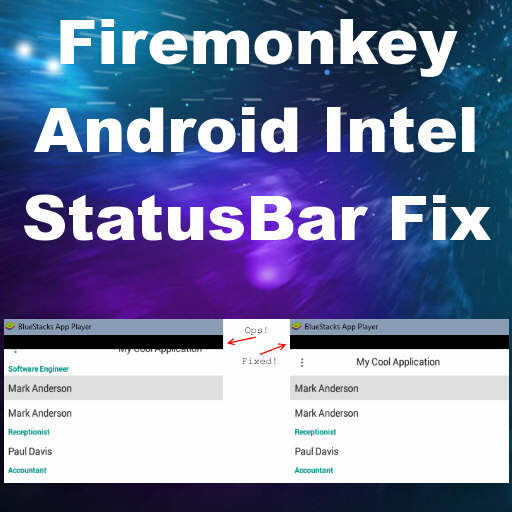 Head over and check out the full blog post for the Android Intel status bar fix for Firemonkey in Delphi 10 Seattle.